There is some controversy about who the ‘real’ Patrick was: Although traditionally credited with the Christianisation of Ireland, we know that an important Roman Gaul called Palladius (also known by the ‘power name’ Patricius) was a church leader (Archdeacon and/or Bishop) in Ireland during the early 5th century before the conventional ‘Patrick’, as were a number of other British and continental churchmen. Britain (and Ireland) had remained under the influence of a strain of christianity called Pelagianism deemed heretical by the continental church as it denied original sin and the need for infant baptism. Palladius was probably one of the people given the task of bringing the Irish and British into conformity. Pelagius was an Atlantic European whose Christian doctrines were probably influenced by syncresis with Atlantic paganism, and whose mission and philosophy sought to influence the heart of Christian doctrine and the Mediterranean church hierarchy during the 4th century. Even in the 2nd century, there was a theologian and bishop of Lyons (Lugudunum) called Ireneus which might well mean ‘Irishman’. Remember – the Druids were an intellectual collegium of northern Europe who were said to have partaken of the study of a number of non-native philosophies, of which christianity was only an interesting new development! No – Patrick (ca. late 5thC) was NOT the first to bring Christianity to the Irish, but left his name to represent this process in posterity. His prominence appears to emerge with the creation of a political historical ‘event horizon’ formed by the saturation of Christian culture and the apparent establishment of Christianised sacral kingship during the 6th-7th centuries. The earliest Irish hagiography that survives today is that of St Brigit of Kildare, which somewhat surprisingly makes no mention of him. The earliest accounts of St Patrick are found preserved in the 9thC Book of Armagh (Ard Macha or Armagh layed claim to be Patrick’s founding church) and include works seemingly written by the actual saint himself as well as two significant 7thC hagiographies. The two original works are two latin letters known as the ‘Confession‘ and the ‘Epistle to Coroticus’: The first is a justificatory account written in the first person of his life and principles. The other is addressed to a military leader or king called Coroticus (a Romano-British name), complaining about the slaughter and enslavement of some of Patrick’s white-clad Irish missionaries. The Confessio contains to magical exploits or much in the way of Christianised pagan themes, but is replete with accounts of visions and the saint’s interpretation of providences. It seems to suggest that Ireland was completely subjugated to christianity by the time of Patrick writing it towards the end of his life, although in reality it is more a description of his mission’s popularity among the nobility and their slaves (many of whom were Christians from Britannia). It neither mentions magi or druids or says anything about native Irish religion save for a reference to ‘idola et inmunda’, usually translated as ‘idols and unclean things’ but which might also be read literally as ‘spirit images and worldly things’ – a good appraisal of the Atlantic religion in my opinion. 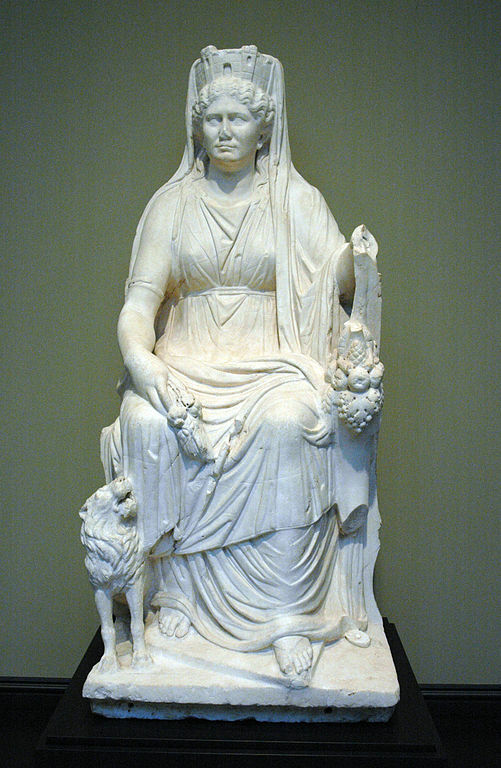 The Latin ‘idola’ is the same as the Greek word ‘eidola’, meaning ‘spirit image’ – it came to represent physical statuary images in the later classical period as christianity increasingly defined these in terms of their material rather than spiritual value. The word munda means ‘refined’, ‘subtle’ or ‘delicate’ (properties synonymous with spirit, and possibly fire and air in the elemental doctrine of the ancients) so inmunda is the opposite. Remember that Christianity was a purificatory religion that rejected worldly things in favour of its ‘higher’ intellectual religious interpretations… Paganism looked to the world to extrapolate its visions. After these the next texts dealing with his life are hagiographical and therefore of a style including miracles and fantastical accounts. These come from the 7th century – a considerable period after the time of his supposed ministry – and are by two quite different authors. The first is by Muirchú moccu Machtheni and is called Vita sancti Patricii or ‘Life of Patrick’. This work (which exists in several fragmentary copies surviving from different eras) credits Patrick with the conversion of Ireland, as well as name-checking Cogitosus of Kildare (author of the earlier Vitae Sanctae Brigitae) as the author’s spiritual ‘father’, perhaps implying that Muirchú was following his hagiographical lead. This also suggests that Brigitine monasticism may have preceded Patrician monasticism in Ireland, as Cogitosus made no mention of Patrick at all – something which would be surprising if he held such precedence throughout Ireland in the late 5th and early 6th centuries during Brigit’s supposed lifetime! Muirchú’s work is marked by its employing Cogitosus’ style of fantastical miracles, but in particular (perhaps befitting the saint’s gender) these are achieved in acts of magical combat mano a mano with a series of Druids. It is written with a distinct Northern bias, and makes particular mention of Armagh. 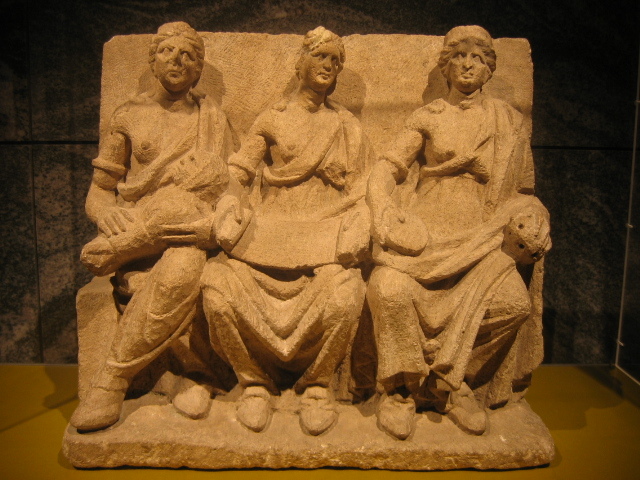 It dismisses the mission of Palladius as irrelevant. 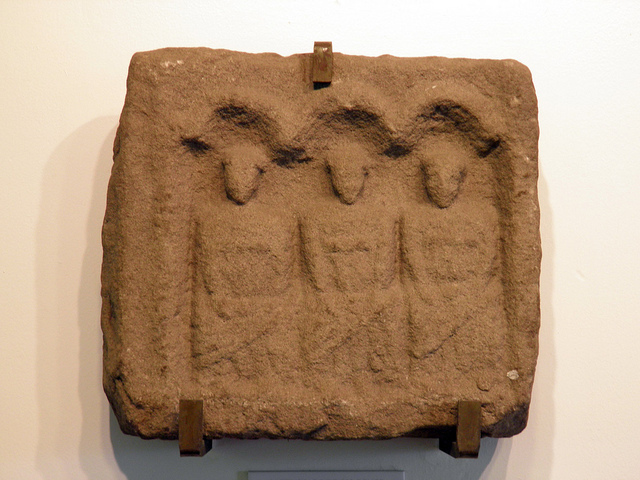 The passage is replete with references to themes that Tírechán considered essentially pagan – of particular interest is the motif of the well (a spring) which recurs again and again in Irish hagiographies as a place of pagan worship, to be converted to Irish Christian use. Next the use of the word Irish word sid in this Latin text, and its use in contradistinction to the deorum terrenorum (earth gods) and fantassiam (‘phantoms’ or ‘images in the mind’). In fact, Tírechán used a number of native words dealing with pagan things, where no Latin equivalent would suffice. For instance, the word erdathe is described as the pagan name for the ‘day of judgement’, and the druid’s tonsure is called airbacc giunnae. General note: Muirchú (M) and Tírechán (T) use the term magus – ‘druid’ is an invention/insertion of later writers and translators. The M hagiography is explicitly designed to show Patrick to be equivalent to and greater than the magi (druids) at the court of the King of Tara. It even gives credence to the prophetic powers of these magi by having them accurately foretell the coming of Patrick and Christianity before being defeated by the saint, and either being killed or converted. This is a vehicle expressing some form of continuity from druids to monks and priests. The Hill of Tara appears to have been a spiritual omphalos for Ireland, and M tells of the sacred fires first lit there to be propagated to the rest of Ireland – somewhat akin to the teine-éiginn mentioned by Martin Martin and other Celtic-region folklore observers between the 17th and 19th centuries. This is why M choses it as Patrick’s primary destination for spreading his ‘spiritual fire’. It is likely that the event was Beltain rather than Easter. 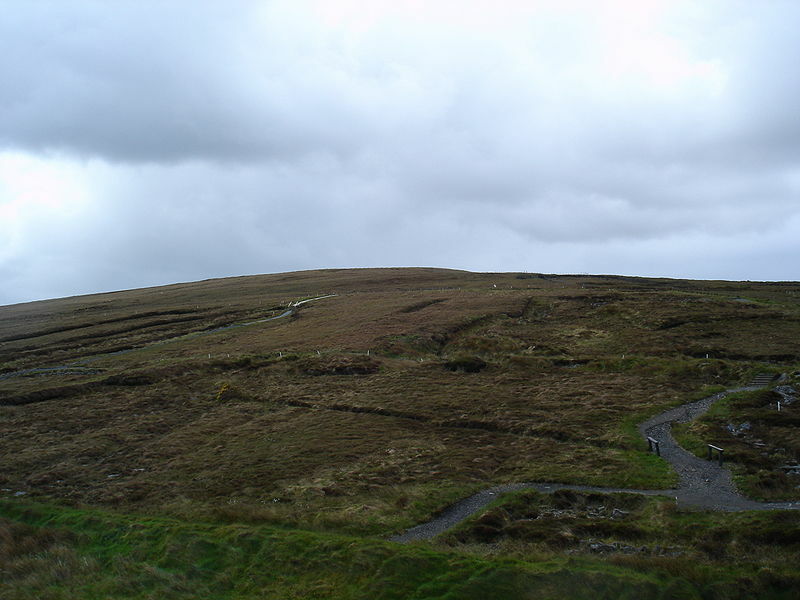 The Hill of Uisneach was also associated with Beltain fires. M’s account makes Patrick’s showdown with the Tara druids seem like the showdown between the wizards Gandalf and Saruman in Tolkein’s ‘Lord of the Rings’ epic – bodies are levitated into the air and dashed to pieces, the sun is blotted out, snow and fog is summoned, and armies are scattered with the twitch of a finger! M wishes to portray a definitive victory over the magi (druids)… The style parallels that of Cogitosus, from whom M admits to have taken his lead. Whereas Cogitosus’ Vita and the Bethu Brigte tries to make Brigit the symbol of the ‘new flame’ of Ireland, the Patrician hagiographers of the 7thC – M in particular – try to assert Patrick’s replacing the pagan fire-kindling festivals (Beltain) and instituting his own Christian Easter fire. Easter or Pascha is/was the most important Christian festival. `… et ridiculosis magorum fabulationibus dicentium in avium substantia majores suos saecula pervolasse, assensum praestare videbimur’ (PL 35.2164). `… the ridiculous myths of the magicians who say that their ancestors flew through the ages in the form of birds’. ‘Augustine’ was a philosopher-theologian with an excellent grasp on classical latin for a monk of the period. As there are no precedents in Roman, Egyptian or Greek paganism, we have to assume he was talking about the Irish magi – otherwise known as the ‘Druids’! In 2008, archaeologists working within sight of the striking stone circle known as the Ring of Brodgar discovered what appears to be a massive and very important stone-built temple complex on the Ness of Brodgar. This ‘temple’ or palace contains evidence of painted masonry and among its remains have been found carved stones (including a carved stone ball), and statuary items made of red clay (and I think here of the ‘idol’ once venerated on Inniskea). The temple is associated with a massive rampart wall some 4 metres thick that runs along the edge of the Ness. 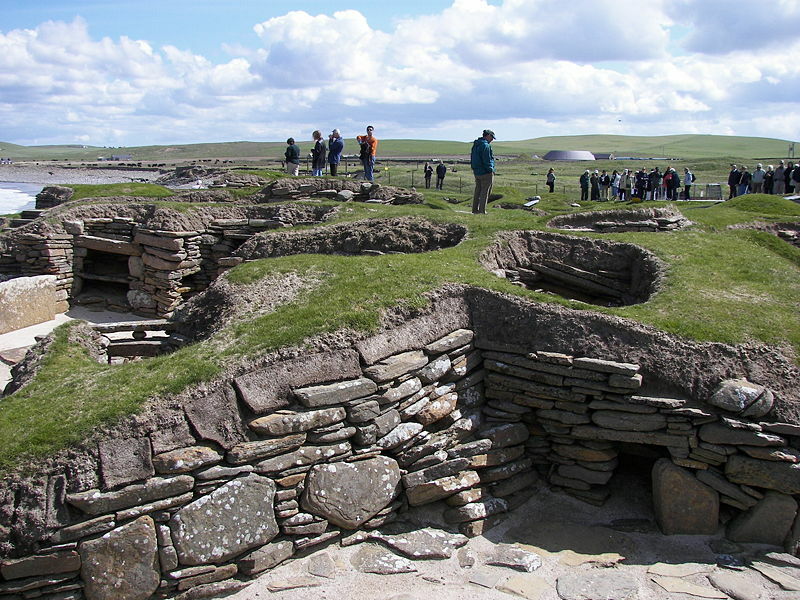 Visitors examining the remains of another sophisticated Neolithic structure in Orkney – Scara Brae. 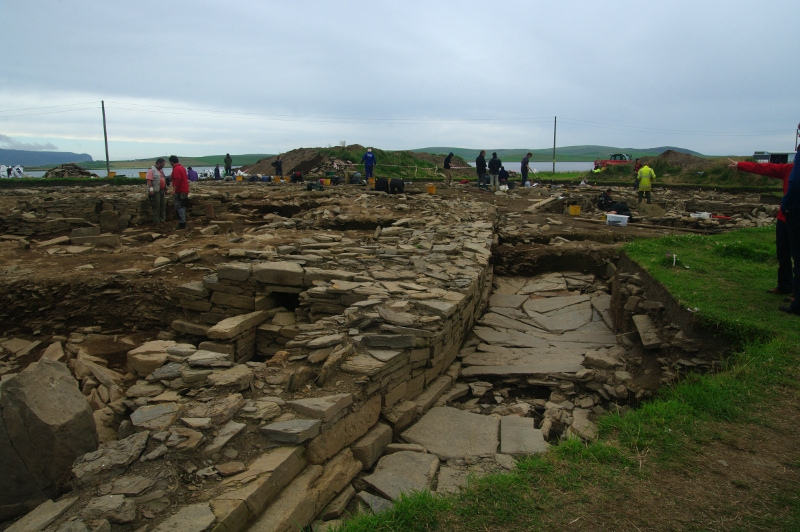 The discovery at the Ness of Brodgar demonstrates the sophisticated neolthic Atlantic culture’s architectural prowess already known about from the site of Scara Brae, uncovered from sand dunes in a storm during the early 20th century, and thought initially to be Roman. The sophistication and scale of the Neolithic stone circles, temples, tombs and settlements across the eastern Atlantic Archipelago (ie – the British Isles and Ireland) points towards a very special culture with a deep spiritual connection to their landscape, the heavens and the cycles of the seasons. Emerging from under the blanket bogs of Co. Mayo in Ireland, the Céide Fields represent one of the earliest sites with evidence of organised human agriculture and have been dated as nearly 6000 years old – from before the introduction of metalworking. As well as the remains of stone houses and field walls, the site is associated with the typical megalithic religious and funerary structures found throughout Atlantic Europe from this period – evidence of a particular regional culture with its own philosophy and way of life that was shared. Paleobotanical evidence points to this barren boggy landscape having once been much warmer and covered in pine forest. Other areas in Mayo and the wider ancient province of Connaught contain similar remains.